Home » Pricing – Your Achilles Heel? Drucker saw a clear link between pricing and profit and also sensed there is an enormous improvement potential simply by a business pricing it’s products and services right. 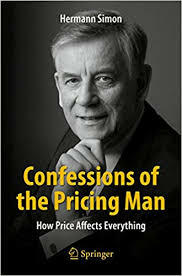 In Hermann Simon’s Confessions of the Pricing Man: How Price Affects Everything Simon touches on the elements of pricing and makes a strong case that many business are losing revenue and profits through poor pricing. Simon believes pricing is about how people divide up value. Simon is a big fan of Drucker and shares the intrigue Drucker had for pricing. Drucker understood profit to be the “cost of survival” and sufficiently high prices to be a “means for survival.” In the 21st century, the word “profit” has become a magnet for protests and negative headlines. Drucker always tried to strike a clear ethical balance. He warned against the abuses of market power. He commented on price transparency, and advocated fair behavior. At the same time, he understood the importance of making money, and described it very eloquently in an opinion piece in The Wall Street Journal in 1975: It is not the business that earns a profit adequate to its genuine costs of capital, to the risks of tomorrow and to the needs of tomorrow’s worker and pensioner, that ‘rips off’ society. It is the business that fails to do so. According to Simon, “Managers tend to have fear of prices, especially when they need to increase them. The fear has one legitimate source: one can never know with absolute certainty how customers will react to a price change. If we raise prices, will customers remain loyal or will they run in droves to the competition? Will they really buy more, if we cut prices? Simon offered an interesting story on value: “This reminds me of my first encounter with an international tax advisor. The first time I had a complex tax issue, he took about 30 minutes to answer it. Then he sent me a bill for $1,500. This amount was so outrageously high that it had to be an honest mistake. So I called him up. “Don’t you think that amount is a bit too high for a half hour of work?” I asked. “Look at this way, Mr. Simon,” he explained. “You could have asked a normal tax consultant. They would have probably taken three days to answer your question, and their answer may still have been sub-optimal. I understood your problem within 15 minutes, and then needed 15 more to come up with the optimal solution for you. Does Your Business Communicate Value? Martin Winterkorn, the CEO of Volkswagen Group, the largest car company in the world in 2014, said at a recent workshop that “we need to build excellent cars, but the brand is just as important as the product.” That is an impressive statement for someone trained as an engineer, and the kind of statement one would not have heard a couple of decades ago. Managers have become keenly aware that value alone does you little good unless you can communicate it successfully. That means that customers understand and appreciate what they are buying. Remember, the only fundamental driver of willingness to pay is the perceived value in the eyes of the customer. Pricing is a little explored or understood concept for most businesses.